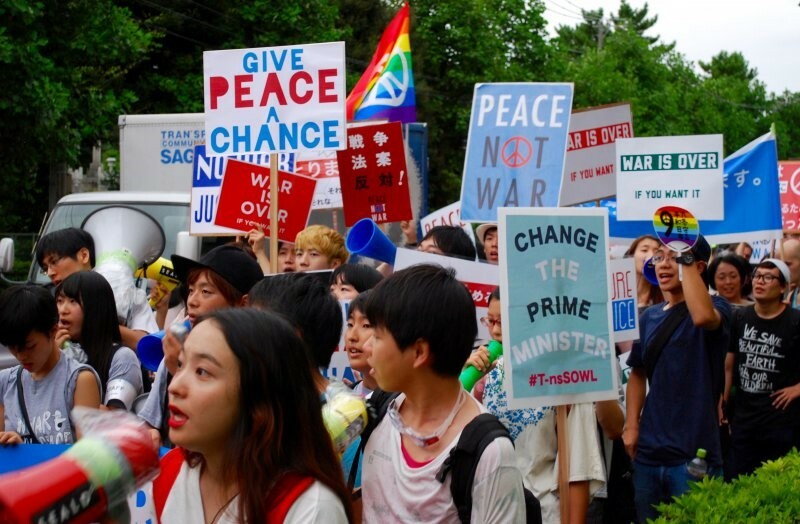 Contributing Editors’ Note: Due to recent media attention on the activists of Students Emergency Action for Liberal Democracy (SEALDS), we have moved up Robin O’Day’s report in this article series—“Social Movements in Japan”— to reflect its timeliness. 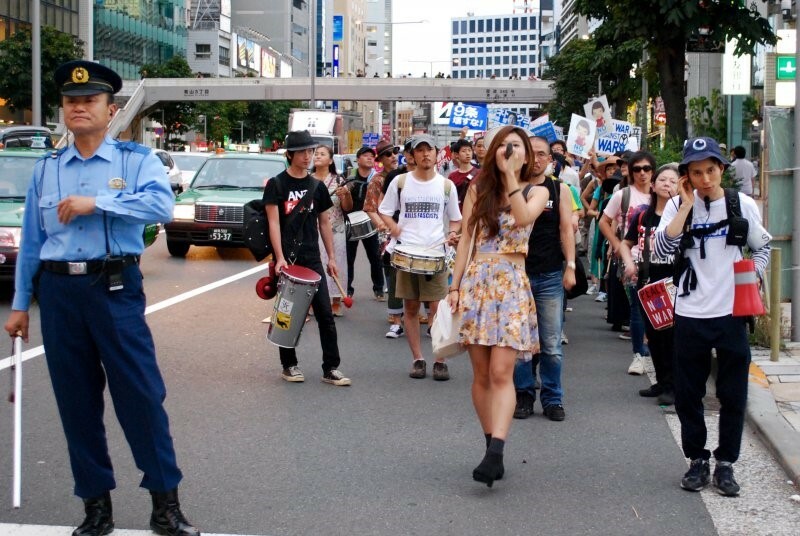 Note on photographs: The author took all photographs of the August 23, 2015 SEALDS demonstration. Do not reproduce any of the images without permission ([email protected]). The streets outside of the prime minister’s residence in central Tokyo are once again throbbing with young people. Following the excitement of the youth demonstrations after the nuclear meltdown (see Love Kindstrand’s forthcoming piece), these areas were surrendered to older environmental activists. But in the last few months, young people have organized, occupied the streets, and taken over the media in ways that would have been impossible to predict. Our research group on contemporary Japanese social movements, Voices of Protest Japan, was in the field interviewing at the time, making a record of this exciting development. For a more detailed outline of this student activist group, see here. After Prime Minister Shinzō Abe proposed the State Secrecy Act in 2013, anti-nuclear activists and legal and media scholars were outraged, viewing the law as a serious attack on press freedoms and government transparency. In response, there were intermittent protests, usually as part of the anti-nuclear demonstrations through which the Students Against the Secret Protection Law (SASPL) generated both large numbers in their demonstrations and media attention in their effort to block its passage. 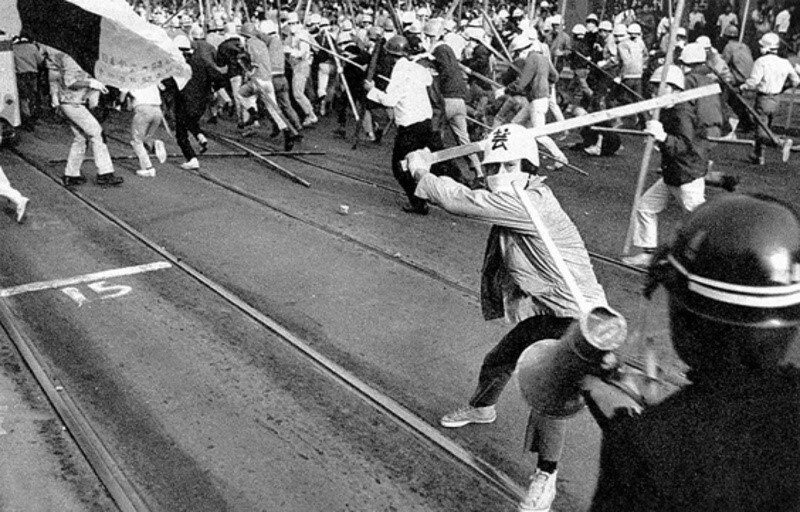 Youth protesters in Japan carry a heavy historical burden. Even today, and as evidenced by the challenges mothers face in publically voicing their concerns over radiation (see the piece by Danzuka, Hauser, and Ueno), the specter of student radicalism from the 1960s and 1970s surrounding the revision to the US-Japan security treaty, known popularly by its Japanese abbreviation ANPO, still haunts activists today. The images of militant, helmeted students are an important point of reference for post-3.11 activist efforts. Separating themselves from the extremism of the past is important, both to avoid being viewed as threatening by the masses and to avoid alienating the media and becoming the target of police action and state surveillance. While the history of ANPO is still hotly debated among academics, and now starting to be reviewed by activists both young and old, the students’ are still faced with a difficult question: How do they challenge the existing situation without being associated with a now discredited past? Part of SEALDs’ strategy is the rejection of an explicit ideology: they are not seeking an anarchist overthrow, a revolutionary movement, or even an alignment with any political party per se. Their calls are far more modest: seeking to ensure “liberal democracy.” Even with or without Prime Minister Abe’s high-handed actions, Japan would still be considered a liberal democracy, but the mounting protests signal public concern about its attrition. Protection of the Constitution, which Abe has circumvented by providing a new interpretation of Article 9 that once prohibited Japan from keeping non-defensive military force, deliberately bypasses the popular vote on constitutional revision—a bold move criticized as unconstitutional even by some of Abe’s own handpicked legal scholars. In contrast, SEALDs is demanding a national security policy, based on cooperation and dialogue, and a social policy that works to reduce the negative effects of labor fracturing, and income tax reform. Far from being political extremists, these students are working very much within the system. In our interviews, their members are well informed and articulate, clearly having given themselves the political education they rightly claim is not provided them in either high school or university in Japan. Playing on the popular ANPO images of helmeted radicals in paramilitary fatigues, SEALDs have made concerted clothing choices—clean cut and nonthreatening but with enough street style to attract a wider youth audience. They also have a technological sophistication that puts them at the vanguard of social media. Through a slick website, coordinated Twitter communication, and internal management by “Line” groups (a popular social networking application), they have crafted their own media and visual presence in ways that neither mainstream nor alternative political movements in Japan have so far demonstrated. Just as importantly, their cool style and technological sophistication distinguish them from the more contentious and unattractive politics of Japan’s old left. These young people often describe themselves as “futsū,” a Japanese word that contains both the statistical sense of a norm and the ethical sense of being normative, expected, respectable, and defensible. 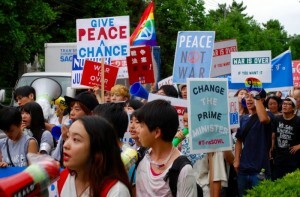 Similar to the mothers who argue that it is futsū to voice their concerns about radiation, these students argue that it is normal for young people to be involved in politics. The popular media are alternately delighted by or dismissive of this symbolic management of collective identity, but both positions seem to miss the point. The strategic position of Occupy—we are the 99%—is echoed even if it is rarely explicitly referred to. At the same time, they are not futsū. In a country where most students are not even sure if it is legal to demonstrate, taking to the streets is decidedly irregular and suspect, although the four years of anti-nuclear demonstrations have clearly paved the way for their movement. But in another way, they are unusual, a fact of which they are quite aware. They are mostly students from elite private universities (Meiji Gakuen, International Christian U, Sophia, and Hosei). These are the young people who will claim social privilege and walk into the last remaining secure jobs in a country that has seen the same sort of neoliberal fragmentation as other liberal democracies. As such, they are quite different from the demonstrators of the past twenty years who were on the margins of the restructured labor market—freeters (serial part-timers), contract workers, the working poor, and other precarious workers. Many readers are likely aware of emerging arguments about the efficacy and ethics of “middle-class revolutions.” Yet in our research, we have heard the opposite. 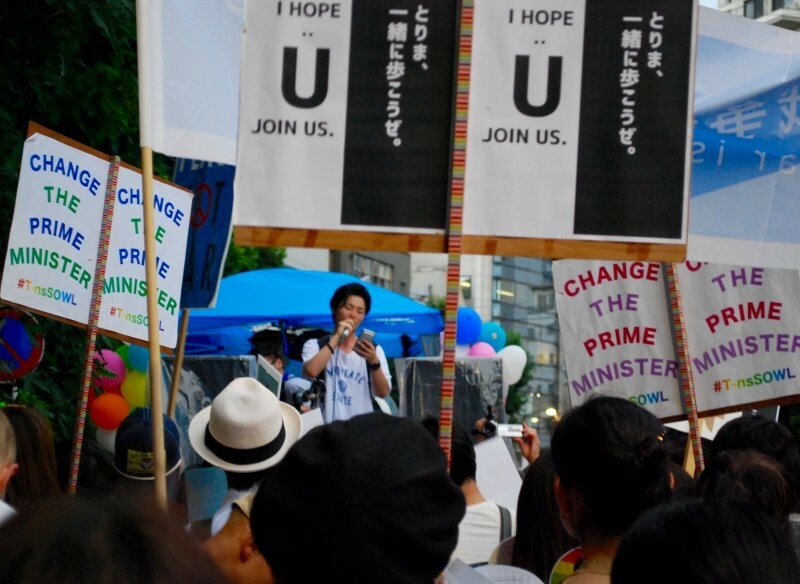 Older activists often express skepticism about “rich kids playing at politics” and see a limitation in SEALDs’ focus on Abe himself as the cause of protest. Personalized attacks, such as placards stating “Dump Abe” and calling for his removal from office, fail to challenge the structure or practices of direct representation, or sufficiently question the dominance of Abe’s Liberal Democratic Party. Although SEALDs is at the forefront of digital politics, they must also contend with online harassment, including vulgar characterizations of its members, unauthorized appropriation of their images, trolling, and fake accounts impersonating the movement. Despite the criticisms and complications, it is important to recognize this group of students for their political innovation at this historical moment. In our interviews, they talk about the relative freedom that they enjoy as students, but rather than treating these four years as a chance to play around and drink, they are seizing an opportunity—an opportunity with risk. In fact, these students may have the most to lose by upsetting the status quo. Despite their desire to work within legal political boundaries, the challenge that they pose to the government is substantial: Is it not normal (futsū) for young people to be involved in politics? If they are successful in re-framing the debate, Japan could end up looking like a very different place. Prime Ministry Abe pushed through the security treaties on Sept 19th. We will see how SEALDs is able to refocus their energies for their next effort. 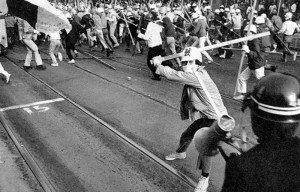 This is the second report of an article series on the social movements that are currently occurring in Japan. Robin O’Day is a Japan Society for the Promotion of Science Postdoctoral Researcher in the Department of History and Anthropology at U of Tsukuba, Japan.